Tranont launched in 2014 and marketed a range of third-party merchant service subscriptions. A few weeks back a BehindMLM reader got in touch to advise that Tranont has added a range of nutritional supplements. The compensation plan has also changed, so it’s time for an updated review. BehindMLM published our initial Tranont review in May 2017. Since then it doesn’t appear anything has changed on the corporate side of things. Tranont is still based out of Utah and headed up by Founder and CEO, Lorne Berry. Tranont still markets third-party merchant subscription services as “Wealth Core”. A bundled Wealth Core subscription costs $125 a month. Individual services can also be purchased separately on a monthly subscription. Balance Life and Vibe are also available in a monthly $140 bundle pack. Tranont’s supplement line was added to the company in late 2017. Additional supplement lines were added throughout 2018. Tranont also markets life insurance through “Tranont Life”. No specific information about Tranont Life is provided on the company’s website. Tranont has split sales of its nutritional supplements, third-party merchant subscriptions and life insurance into two compensation plans. There are ten affiliate ranks within Tranont’s supplement and subscription compensation plan. PV stands for “Personal Volume” and is sales volume generated via retail sales and an affiliate’s own orders. GV stands for “Group Volume” and is the sum total PV generated by an affiliate and their downline. Note that required Associates must be commission qualified to count (generating at least 100 PV a month). Defining what exactly preferred contracts were is another thing Tranont failed to do. Two years later the company still fails to define what a preferred contract is. Based on the separation of volume bonus and preferred contract commissions however, I believe a preferred contract refers to the sale of a third-party insurance plan. With that out of the way there are five affiliate ranks within Tranont’s insurance compensation plan. Tranont’s compensation plan documentation doesn’t state how points are generated but I assume it’s through the sale of third-party insurance plans. Required rank volume for subscription compensation ranks is counted over a rolling three-month period. To qualify for commissions a Tranont affiliate must maintain 100 PV a month. Tranont pays a retail commission of up to 35% on the sale of supplements to retail customers. Tranont refers to residual commissions as a “volume bonus”, which is paid out via a unilevel compensation structure. In our initial review we couldn’t ascertain whether volume bonus dollar amounts were rank caps of guaranteed monthly payments. Tranont has failed to clarify this in their current compensation plan documentation. Note that non-certified Agents are paid based on supplement rank. Tranont rewards affiliates who sign up with a Builder Pack and qualify at Pearl and higher within a specified time period. Tranont takes 13% of company-wide revenue and places it into a 4% and 9% Leadership Bonus Pool. Note that Black Diamonds and higher retain their two shares in the 4% pool. The insurance component of Tranont’s compensation plan details five bonus pools. If a Tranont affiliate is a certified writing agent, at the Vice President and President subscription ranks they receive one share in a 5% pool. generate and maintain 12,000 Personal Paid Points per month. It is unclear whether the $500 and $600 Jeep Bonuses stack. That said I’d assume the $600 payment overrides the $500 payment if qualified for. Tranont affiliate membership is $99 and then $25 a month. There is also a $25 a month fee for “business tools and support”. In order to be eligible to qualify for all offered commissions and bonuses, new Tranont affiliates must sign up with a Core Package. The current Tranont membership application states that ‘all associates are automatically enrolled in a recurring monthly payment depending on their selected package‘. Builder – $250 a month. Tranont membership is an application purchase plus monthly subscription program. Service-based MLM companies are notorious for having overtly complex compensation plans. Tranont does themselves no favors by essentially running two mostly separate compensation plans. Having refreshed myself on Tranont’s compensation plan as of 2015, it still took me a while to get my head around the current two-plan model. Tranont affiliates are going to be hard-pressed to explain the ins and outs of the current compensation plan, which can lead to people being signed up without fully understanding what they’re getting into. This is bad for business because it can potentially set unrealistic expectations and/or misrepresentation of Tranont’s business opportunity. I find it pretty slack on Tranont’s part that even after two years there’s no dedicated compensation plan section on their website. This needs to happen sooner rather than later, along with clear explanations of terms in the compensation plan (volume bonus??? personal points???). Personally I get the sense the subscriptions weren’t working out on their own, and so Tranont has added supplements. Owing to the complexities of a service subscription compensation plan, I think they need to decide what kind of MLM company they want to be. Two compensation plans that combines one already complicated plan is a nightmare to research, explain and market. As to the supplement products, nothing really stood out. That’ s not to say they’re not effective, just that I very much got a “tacked on” feel going through them. Out of curiosity I punched “collagen liquid supplement” into Google. The first result is a $35.94 16 fl. oz bottle from iHerb. The iHerb product comes to $2.24 a fl. oz., versus Tranont’s Icaria Glow for $2.96 a fl. oz. Glaring red flags in Tranont’s compensation plan are mandatory autoship, which takes care of monthly PV requirements. This reduces Tranont to an autoship recruitment scheme, which without the supplements was a problem two years ago. The website asks you to pick one of three affiliate plan options and informs you of the ongoing $125 monthly subscription fee. There is no way to sign up without purchasing one of the three offered plans. Forcing affiliates to purchase a product or service to earn commissions in MLM is pay to play. Paying affiliates to recruit others who do the same is chain-recruitment, which seems to be the core of Tranont’s MLM opportunity. There is no incentive or requirement to make retail sales in Tranont, which is entirely on the company. I’m just speculating here, but I believe that if the third-party service subscriptions were retail viable, there’d have been no need for Tranont add supplements. Certainly nutritional supplements are easier to market than complicated wealth plans, but the fact remains that with forced monthly autoship – retail is unlikely. A Tranont affiliate can simply sign up, autoship their way through commission qualification and earn by recruiting others who do the same. If that’s what the majority of Tranont affiliates are indeed doing, then the company is operating as a pyramid scheme. The good news is on a micro level this is easy enough to verify. Simply as your potential upline what their retail monthly PV is and compare to their autoship PV. If retail PV isn’t at least equal to their autoship PV, that affiliate’s Tranont business can be written off as a pyramid scheme. Gut feeling? You’re going to be hard-pressed to find a Tranont affiliate with any sustained significant retail activity under them. I love how this article says “I assume “ and “I’m just speculating here but it is my belief”. So do you go about your daily life just guessing about things you really don’t know about or have never tried? These supplements are amazing and life changing. If you don’t want to try them then that’s fine but don’t try to discourage others about a product you haven’t even tried. Know your information before wasting peoples time by writing an article full of assumptions and garbage. So do you go about your daily life just guessing about things you really don’t know about or have never tried? The word “assume” appears in relation to minor unspecified clarifications in Tranont’s compensation plan. That is on the company for failing to provide clarification, which is all I was pointing out. And that’s certainly valid criticism, which you failed to address. Tell me, does taking Tranont products turn you into a disingenuous prat or is that all you? There are a lot of assumed inaccuracies in this post. 1.) Auto ship is NOT required- there are lots of ways to make your PV. My husband meets his PV with zero out of pocket— it’s all through his customer purchases. 2). Your references to subscriptions is inaccurate- that compensation plan is all from the life insurance side of Tranont. You must be a certified life agent in your state in order to sell or refer life policies. The second compensation plan is for life agents only. 3). The subscription services (legal, tax, etc…) fall under the same compensation plan as the health supplements. 4). The supplements were added in late 2017 (not 2018). 5). Süthe CBD which you make zero reference to was added in late 2018. 6). Commissions on customer sales are 10-35% based on total volume of customer sales and you do not need to maintain an auto ship to receive commissions. An associate receives PV and CP for customer purchases. 7). An associate would only pay the $25 monthly website fees if they weren’t on a core- core plans include this fee. I’m sure there are many more inaccuracies in this post but I’m out of time. I’m by no means a network marketing pro but I’ve been around the block a few times. I’ve never made money with an MLM before and by month two I was making money and driving a paid for Jeep without Tranont. As stated in our review, Tranont’s compensation plan is complicated. And the company does itself zero favors by not providing the public with any information on it. all associates are automatically enrolled in a recurring monthly payment depending on their selected package. Also the Core Package marketing material states “an application purchase plus monthly subscription program”. Core is required to earn all commissions and bonuses in Tranont’s compensation plan, thus autoship is required to earn all offered commissions and bonuses. Furthermore in the screenshot provided, Core is not provided as an option. 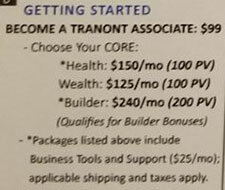 Tranont’s official marketing material states new affiliates pay $99 and then “choose your CORE”. Your references to subscriptions is inaccurate- that compensation plan is all from the life insurance side of Tranont. Thanks for the clarification. As noted in our review, Tranont has a complicated compensation plan that they need to rework. We included both compensation plans in the review. I’ll update to reflect the subscriptions come under the second plan. Added clarification on the supplement line introduction. Updated $99 affiliate signup option (annual fee changed to monthly since our review). Süthe CBD which you make zero reference to was added in late 2018. I don’t see any listing for Suthe on the health supplement section of Tranont’s website. It’s not in the online store either. by month two I was making money and driving a paid for Jeep without Tranont. You’re representing you joined Tranont, build your business from scratch, hit Jade in your first month (1500 GV) and by month two had leased a Jeep to put your newly acquired Jeep Bonus towards? And why is hubby meeting separate PV requirements? Do you not live together? I hope you haven’t stacked accounts (and who knows what else). Need I remind you misleading income claims are a violation of the FTC Act. I have been approached by family members who claim that Tranont’s nutritional products have turned their life around and restored them to total health. Even a local chiropractor is marketing these products. I have been doing research to find out where these products are made. Where is their lab? How do we know that these supplements are pure, or produced under safe conditions? I can’t find anything on the internet, or on their website about this. Before I put something in my body, I want to know more about who produces it, where it’s produced, etc. Any advice as to where to locate this information would be great. Otherwise, it seems like these products where just thrown into the mix because it’s pretty easy to sell nutritional products. Thanks! Even a local chiropractor is marketing these products. Why the “even”? There’s nothing surprising about a quack doctor selling quack medicine. Don’t bother. The fact that you’re asking these questions means you’re not the market for these products. The thing that I find funny about mlm people are the fact that they get so defensive any time any one is critical of their program. Huge red flag for me.